You are here: FPL Home / Research / Research Emphasis Areas / Advanced Structures	/ How does it apply? To meet today's needs, FPL researches high-value homebuilding that can produce houses that are more livable, more responsive to universal and regional environments, and more frugal with available resources than those using current practices. The current housing prototype is an amalgam of mobile homes, modular construction, and a partially evolved version of the traditional type described previously. The Research Demonstration House at FPL. Today's new houses incorporate more petroleum-based and other synthetic materials, more applied chemical compounds, more machine-fastened components, lighter weight materials, and greater across-the-board standardization of materials and methods. Material sources are more diverse than in the past. Because construction is a huge use of energy and creates considerable waste, FPL is researching the environmental effects and energy use of wood-based structures and the processes of updating and remodeling them. 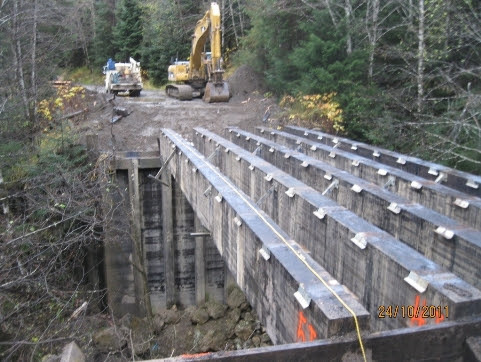 Jenny Creek Bridge, AK with glulam beams exposed. Photo credit: US Forest Service, Region 10 Engineering Staff. Advanced structures research and development at FPL is focused on developing next generation residential and non-residential structures that are aesthetic, affordable, functional, durable, low maintenance, energy efficient, and disaster resistant (earthquake, high wind, hurricane, tornado, wildfire, and flood). FPL advanced structures research will improve the performance of structures during natural disasters while providing an outlet to use building materials produced from small-diameter timber. Research results will be made available to home builders, the forest products industry, and consumers. As an evolution of our research and partnerships, academic and industry leaders, together with the FPL, formed the Coalition for Advanced Wood Structures (CAWS). The Coalition is but one example of the ways in which FPL works with partners to bring new technology and research into the structures that we use every day.